My wife and I recently bought new furniture, and part of that included a new desk for me. I’m taller than the average bear, which means my knees were often jammed into the keyboard tray. The desk was made of pressboard, which tends to be damaged more easily than hardwoods. The hutch on the desk often got in the way rather than helping me out. 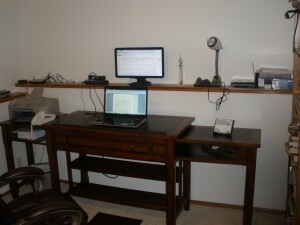 I occasionally like to work standing up, which was nearly impossible on this desk. Of course, the desk was free, so I couldn’t really complain. While we were shopping for a new couch, I thought I’d take some time to go investigate the office furniture to see what might be available. There were also desks perfect for my work standing up. They were designed to be used sitting at a stool. Using the stool, I found my knees to (again) jam right into the bottom of the desk. This got me closer (at least I could type comfortably standing up), but still not close enough. I tried a standard office chair and found that my knees fit, but my hands were just a little too high to be comfortable. In other words, these desks were too big. I also found plenty of desks at a standard height, and all of them — even the $3000 wonder I sat at for a moment just to see how it felt — had the same problem. My knees jammed into the bottom of the desk. How frustrating. All of them were too small (err.. short). Then, with a spotlight shining with a heavenly gleam, and the music over the speakers reaching an awe-inspiring tone, I spotted the Portland Loft Architect’s desk. Hallelujah! The desk was at the perfect height for my hands when I stood up, and also had a nice pull-out drawer that folded into another table — this desk was perfect for work standing up and sitting down. Even better, my knees didn’t jam into the bottom of the desk. I’d stumbled into one of the few stores in North America that actually carries this item in their store, and even the guys who delivered it said they had never seen one before. And that’s not all. Beyond the primary features of not jamming into my knees and allowing me to work standing up, the desk top lifts up, which can allow me to adjust my keyboard to a more ergonomic position. This is also useful if I get more seriously into drawing — another hobby I’d love to get better at. The desk arrived last week, and when fully extended, it takes up a good portion of the wall. As I started working, I ran into my next problem. Working standing up meant that my head was tilted down to see my laptop screen, and I could feel that it was going to end up straining my neck in the long run. Luckily, as a computer guy, I have a second monitor I often use as an extended display. I decided to try taking advantage of a second lucky feature of my split-level house–a built-in shelf on the bottom floor. This shelf is the perfect height to place a monitor. Success! I’m now comfortable working both standing up and sitting down. In other words, this desk is just right! If you have the same problem I do, consider investing in an architect’s desk.